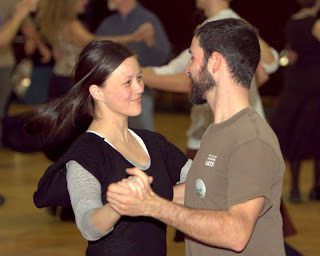 We primarily do three types of dancing at FOOTMAD dances — contra dancing, square dancing, and waltzes. If you find yourself patting your foot or moving to good music, if you can walk and listen, then you can do all of our dances. Of course you can improve your skills as you gain experience, but nothing prevents even true beginners from dancing and having a good time. We do not require special clothes or skill levels at our dances. Our more experienced dancers will gladly help you with all of our dances and we love to have beginning dancers attend. Dancers explain what contra dancing is and why they love it. This video is one of a series by CulBlu Vlogs. Contra is traditional New England folk dancing. Americans have enjoyed contra dances since Revolutionary times. They combined ideas from French and English country dancing with their own way of having fun and came up with contra dancing. It's a social dance akin to square dancing that has retained its simple, open, community-oriented spirit. Contra dancing is great exercise and great fun enjoyed by people of all ages and lifestyles. It shares some elements with square dancing such as "swing your partner" and "do-si-do," but the couples form long lines rather than squares. It involves mixing with the other dancers as each couple does a set of other figures, called by a caller, with another couple before progressing to a new couple and repeating the routine. Since the routine always repeats in contra dancing, the role of the caller tends to diminish as the dance progresses. Square dances consist of four-couple squares. Our squares differ from most modern square dancing because we do it to live music, we do not require lessons or uniforms, and we tend to stick to more traditional dance forms. Our circle dances (often called big circles) start with everyone in one or two big circles. Usually we will have a waltz just before the break and as the last dance of the evening. If you don't know how to waltz, let our experienced dancers help you learn how to do this beautiful couple dance. Although it may not look like it, at the most basic level waltzes consist of simply walking to the music — just as in squares and contras.